Owing to the fall in crude oil price and the economic recession in Nigeria, it has become expedient for governments at all levels to ensure diversifying her economy to deal with the issues of economic downturn. One of such efforts is reverting back to Agriculture which used to be the mainstay of Nigeria’s economy before the discovery of oil. To this end, the Abia State government, under the leadership of Governor Okezie Ikpeazu is embarking on oil palm revolution, as the way to economic sustainability for the state going forward. Other agricultural produces like ginger, pineapple plantation and cassava farming are not left out as the state Ministry of Agriculture under the headship of Hon. Uzo Azubuike as commissioner is also piloting in high yielding varieties. This is part of government’s efforts at agricultural revolution and making Abia an economic dependent state. The Abia State government says its plans at developing oil palm value chain is to make the state the number one in oil production, not just in Nigeria but Africa. 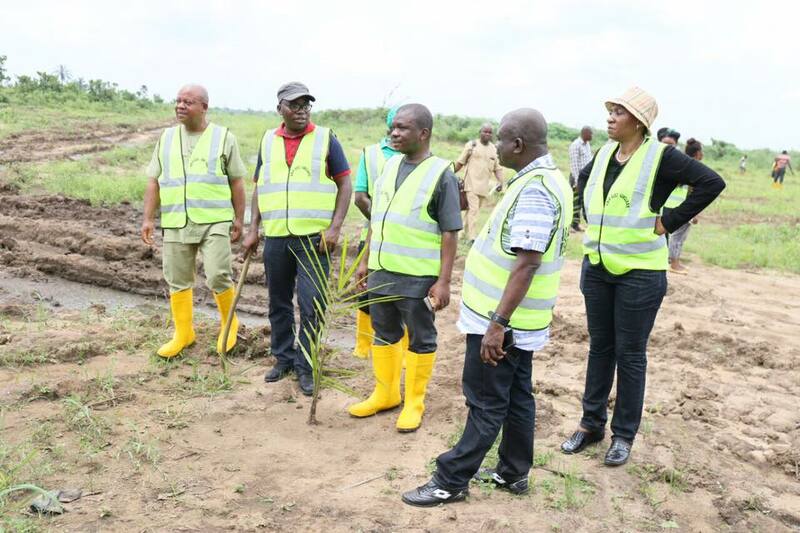 To achieve this, the state government has set a target of developing 7.5 million seedlings between 2016 and 2019, targeting 10,000 hectares of oil palm plantation across the state. This would be achieved in phases. It will be recalled that the last time a state in Nigeria embarked on oil Palm plantation was in 1964, by the then Eastern State under the governorship of late Dr M.I. Opara. 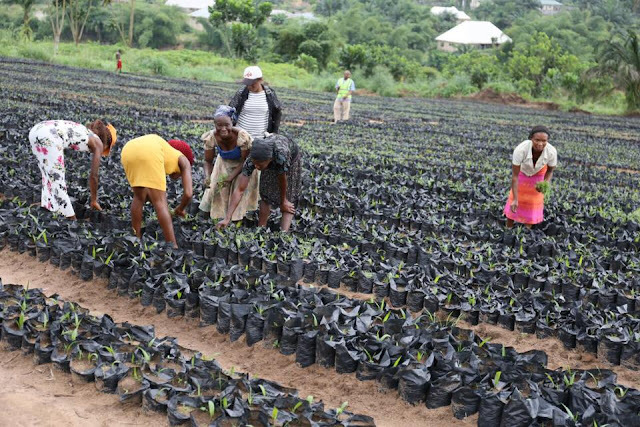 According to Hon Uzo Azubuike, the state is targeting 2 million seedlings in the first phase of the oil palm seedling, the second will produce 3 million, while the third will deal with 2.5 million seedlings. At Ahiaba Umueze, in Osisioma Ngwa Local Government Area of the state, visited by newsmen, it was discovered that over 1.5 million nuts have already been planted. The Commissioner for Agriculture, Hon. Uzo Azubuike while answering questions from newsmen at the location said the Dr. Okezie Ikpeazu led administration had through the project employed over a thousand people especially youths and women in the communities and created wealth for families. He said the seedlings were got at #350 and would replicate over 700 million naira in the next one year, thereby increasing the revenue generation of the state. The Agric boss revealed that the state is establishing a Community Based Oil Palm Project which intends to inject the seedlings into the communities to achieve this. The seedlings according to him would be sold to farmers at subsidized rates, which would be tested within the selected pilot communities. The essence he said, is to ensure that every farm land has two to three stands of high yielding oil palm growing in it. This is also geared towards tactically phasing out the low yielding varieties by the state government. Under the arrangement, each community would have an anchor that would buy off Fresh Fruit Bunches for procession, making it possible for every community to have a mini palm processing mill, while the state builds an oil palm refinery. The Commissioner further revealed that following the zero tolerance to land waste of the state government policy, it has also embarked on ginger and pineapple production at Ohambele, Ukwa East Local Government. The government is procuring a ginger processing machine to enhance effectiveness and sustainability. Also at Omuma Uzo, Ukwa West Local Government, the state government has began the multiplication of high yielding cassava varieties. Hon. Azubuike explained that the varieties which were gotten from the Michael Okpara University of Agriculture, Umudike, are TME 419 and Pro Vitamin A. He said the interest of the state government is on the stem which would be distributed to farmers because of its disease resistance, high yielding and more nutritious qualities. According to the Commissioner for Agriculture, the state is recruiting extension agents to be sent to communities to educate the people on modern ways of farming in a bid to sustain the project. Some residents of the host communities who spoke to newsmen commended the state government for such a giant stride and pledged total support for the project.